So I moved to Lagos 3 weeks ago for work and have a ton of stories to tell you already. Lagos is a lot of things, good and bad, but it is unquestionably FUN! I love going out to dine and Lagos is a haven for foodies like me! There are dozens of cafes, bars, restaurants, hotels, bukkas and joints everywhere and I intend to eat and drink my way through as many as I can while I'm here with my foodie sidekick Dammy! I discovered the blog Eat.Drink.Lagos and it is awesome! I read their reviews before I go to places and I love their wit and humour in writing! Last Sunday we went for Brunch at The Foundry (No 19, Glover Road, Ikoyi, Lagos Nigeria +234-817-200-1143 | +234-817-200-1152). Like most Lagos places I have been to, it was inconspicuous and there was no large sign. The decor is nice and under stated and it has an American diner feel. We were sat near the cafe and kitchen and I could see how the food and drinks were being made, which I liked. The waiter was friendly and attentive. I had the American breakfast which had scrambled eggs, pancakes, sausages. Because I don't eat bacon, I had extra sausages. Dammy had toast and nigerian scrambled eggs i.e with pepper. The pancakes were not the best, I make better at home. But the eggs were light and fluffy and the sausages were Nigerian made ones that tasted like flavoured beef which I loved. To drink, I had the chai latte and cupaccino and they were both strong and delicious! Breakfast ranges from N2500-N4000 which from my Abuja standards seemed steep, but I am learning that eating out in Lagos is alot pricier! Today I went to Bistro 7 for Brunch with a few friends. (273 Kofo Abayomi St, Victoria Island). It is also quite difficult to locate but once inside it was worth our getting lost. The decor is really nice and modern, and it was quite packed. They have these large white menus which I liked and a wide variety which were all available. 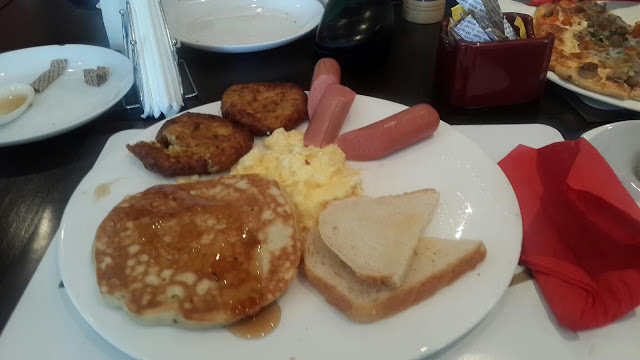 I had the Breakfast platter which had one (as in a single) pancake, toast, chicken sausages, hashbrowns and eggs. I ordered a banana pancake which was warm and delicious, and the scrambled eggs were perfect. However, the sausages were actually frankfurters and the hash browns were oily and soggy.To drink I had a masala chai latte which was perfect. The let down was the service was really poor. I don't know if it was because they had quite a full house, but they were so distracted and not particularly friendly. I asked for no bacon or toast and he brought both. The food took almost an hour to come out, we had all finished our drinks well before it arrived. They pacified us with some nice warm bread which was complimentary but we were all so hungry that it didn't help. My friends had the pizza, which was fair, a seafood pasta which was well seasoned, and eggs benedict which was also nice. 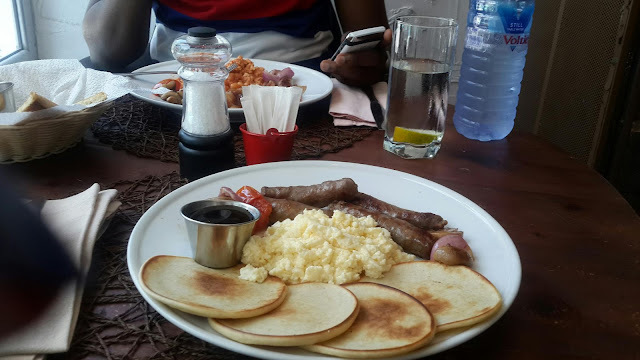 Breakfast costs between N3500-N4500 and drinks about N1000 so it is not cheap. I would go back though, but maybe at a less crowded time in the hope of a better service! That's it for today folks! I will bring you more stories from my Lagos shenanigans as I go along! Hopefully my will to blog has been revitalized! 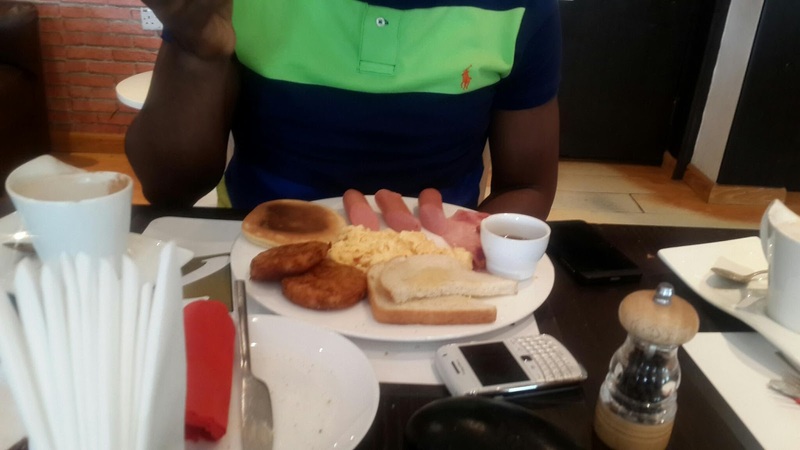 I prefer the Ikoyi breakfast tho. This pancakes look lovely! Hopefully you have settled inot Lagos very well. Welcome.